Download "JOB DESCRIPTION. Uniformed Regular Employee, Full Time"
1 JOB DESCRIPTION POSITION TITLE: SUPERVISOR: POSITION TYPE: RETIREMENT PLAN: SOCIAL SECURITY: MEDICARE: FLSA: Training Officer Deputy Chief Uniformed Regular Employee, Full Time KP&F Exempt Applicable Non-Exempt Position POSITION SUMMARY: This position is responsible for the coordination, scheduling and report generation of all Fire District Fire and EMS training programs including the electronic and hands on monthly trainings, the new hire training program, shift level training programs, specialty trainings, and apparatus operator testing as needed. The Training Officer (T.O.) will research, develop and present training programs. He/she may be assigned additional special training goals that are needs based and provide assistance to the employees of the Fire District at the direction of the Deputy Chief and/or the Fire Chief. The T.O. facilitates coordination, communication and cooperation with Staff, training and other personnel within the District as well as other training personnel throughout the county and metropolitan area. The T.O. will directly supervise the work of all in-house instructors and guest instructors. The T.O. devotes approximately 50% of time to meetings, database management, training and program development in a general office environment, 40% to training fire district personnel, and 10% to fire scene response. This position reports to the Deputy Chief. DUTIES AND RESPONSIBILITIES: The following duties represent the essential functions of this position. Additional duties may also be assigned and are essential to the successful performance of this position. Prepare educationally sound lesson plans and programs of instruction as a finished package for use by qualified instructors. This includes communicating with Staff about their individual training expectations and developing a program to meet those requirements. 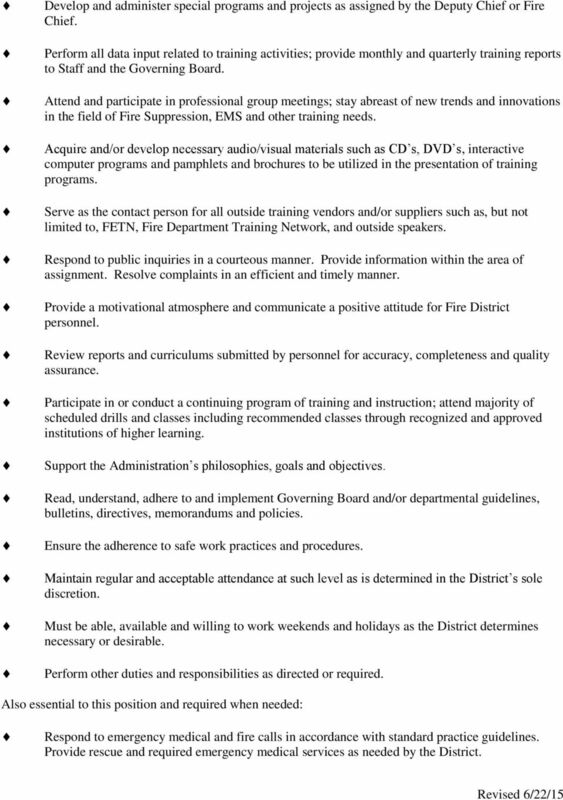 Responsible for identifying and assessing District training needs, scheduling training programs and coordinating schedules with Fire District personnel. Submit recommendations for training activities; work with Staff to set and oversee training budget. Organize a general training plan for the following year, six months in advance, and present to Staff. Communicate directly with both internal and external training personnel and organizations to plan, identify, schedule, coordinate, deliver, execute and evaluate training activities. Coordinate all specialty trainings with designated instructors, i.e. Trench, EMS and RIT. 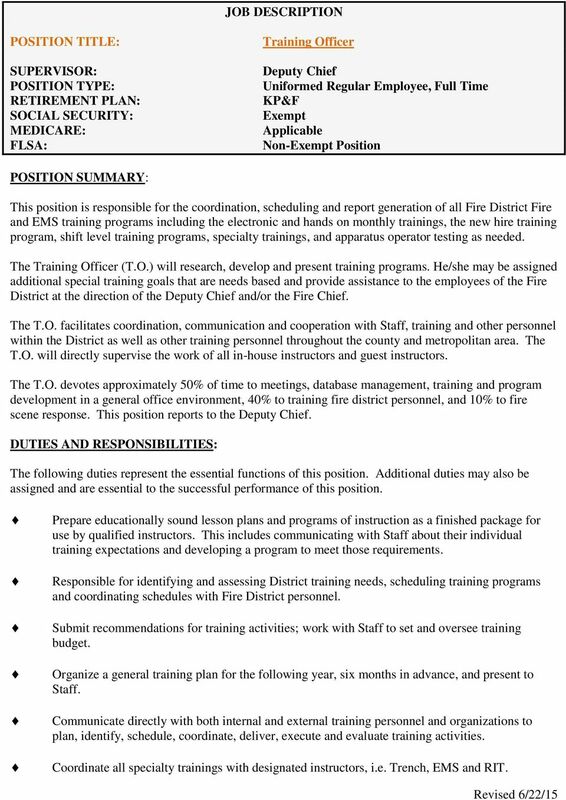 2 Develop and administer special programs and projects as assigned by the Deputy Chief or Fire Chief. Perform all data input related to training activities; provide monthly and quarterly training reports to Staff and the Governing Board. Attend and participate in professional group meetings; stay abreast of new trends and innovations in the field of Fire Suppression, EMS and other training needs. Acquire and/or develop necessary audio/visual materials such as CD s, DVD s, interactive computer programs and pamphlets and brochures to be utilized in the presentation of training programs. Serve as the contact person for all outside training vendors and/or suppliers such as, but not limited to, FETN, Fire Department Training Network, and outside speakers. Respond to public inquiries in a courteous manner. Provide information within the area of assignment. Resolve complaints in an efficient and timely manner. Provide a motivational atmosphere and communicate a positive attitude for Fire District personnel. Review reports and curriculums submitted by personnel for accuracy, completeness and quality assurance. Participate in or conduct a continuing program of training and instruction; attend majority of scheduled drills and classes including recommended classes through recognized and approved institutions of higher learning. Support the Administration s philosophies, goals and objectives. Read, understand, adhere to and implement Governing Board and/or departmental guidelines, bulletins, directives, memorandums and policies. Ensure the adherence to safe work practices and procedures. Maintain regular and acceptable attendance at such level as is determined in the District s sole discretion. Must be able, available and willing to work weekends and holidays as the District determines necessary or desirable. Perform other duties and responsibilities as directed or required. Also essential to this position and required when needed: Respond to emergency medical and fire calls in accordance with standard practice guidelines. Provide rescue and required emergency medical services as needed by the District. 3 Drive and operate fire apparatus as allowed by District policy. Inspect and maintain emergency equipment and radios to ensure proper operating condition; maintain an adequate supply of medical aid equipment and other disposable materials. Listen to station, vehicle, or portable radio and respond to fire alarms; lay and connect hose; operate extinguishers, hose nozzles and direct fog and water streams; raise and climb ladders; use axes and similar tools to ventilate buildings and expose hidden fire areas; participate in post-fire salvage operations such as protecting, removing and recovering contents. Perform emergency rescue and required emergency medical services such as cardiopulmonary resuscitation (CPR) and application of compresses, back and neck supports, braces and splints. Operate saws, power jacks and a variety of other rescue equipment and tools; remove fire and accident victims to a safe location. Decontaminate apparatus, equipment, and clothing exposed to potential airborne or blood borne diseases. Perform general maintenance of assigned equipment and quarters. Keep current on all firefighter certifications as well as all certifications, licenses, etc., required for the position of Training Officer as required by the city, state and federal licensing authorities, if any. Keep informed and updated of any changes in credential requirements and advise Administration. MINIMUM QUALIFICATIONS: Possess the minimum of an Associates of Arts degree from an accredited college or university with major course work in Education, Public Education, Public Relations or Fire Protection. Experience in training course development is required. Must gain EMS Training Officer I certification within 12 months of hire date or first available class (if not already certified). Possess a valid driver s license and comply with the Fire District s required documentation and verification. At least five years service as a firefighter with CFD2 or five years experience with another department including three years experience acting in the capacity of Training Officer, Training Coordinator or Training Chief. 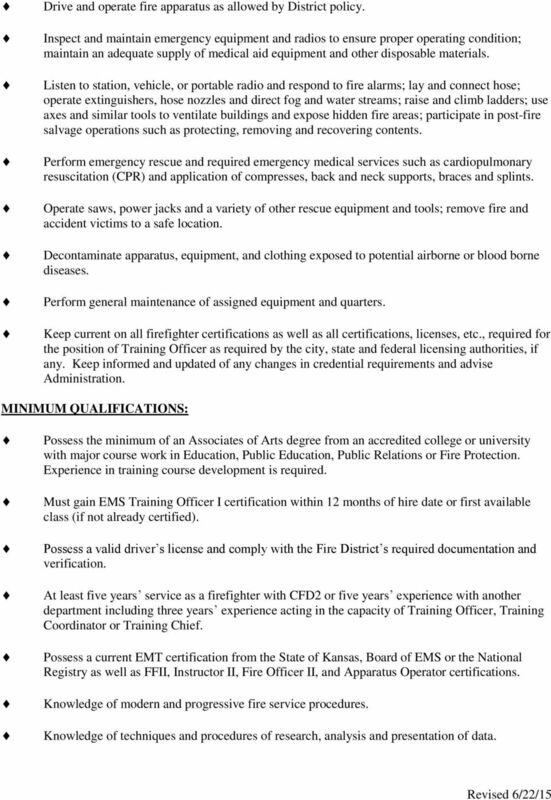 Possess a current EMT certification from the State of Kansas, Board of EMS or the National Registry as well as FFII, Instructor II, Fire Officer II, and Apparatus Operator certifications. Knowledge of modern and progressive fire service procedures. Knowledge of techniques and procedures of research, analysis and presentation of data. 4 Basic knowledge of modern office procedures, methods, computer equipment and technological enhancements. Must have knowledge of database management and other tracking mechanisms. Ability to interpret, explain and enforce Fire District policies and procedures. Must possess exceptional organizational and time management skills. Excellent written and oral communication skills. Ability to maintain accurate records and write clear and concise reports. Ability to plan, develop, implement and supervise activities for large size groups. Ability to establish and maintain positive effective working relationships with the Governing Board, Fire District personnel, city officials, outside public safety agencies, business and educational leaders, the news media and the public. Ability to independently maintain and/or improve knowledge, skills, and abilities. Must not pose a direct threat or significant risk of substantive harm to the safety or health of himself/herself or others. This position may also require: Successful completion of a background examination, including a drug screen. Successful completion of an oral examination by a Fire District oral review board. Successful completion of a pre-employment physical examination. Medical certification for the use of Self-Contained Breathing Apparatus. Knowledge of rescue and emergency medical principles, practices, and techniques. Knowledge of modern firefighting principles, practices and procedures, including hydraulics. Ability to function in life/death situations relying on sight, hearing, smell and touch and to make critical decisions while maintaining safety of others/self; accept risk of bodily injury/death in performance of duties. 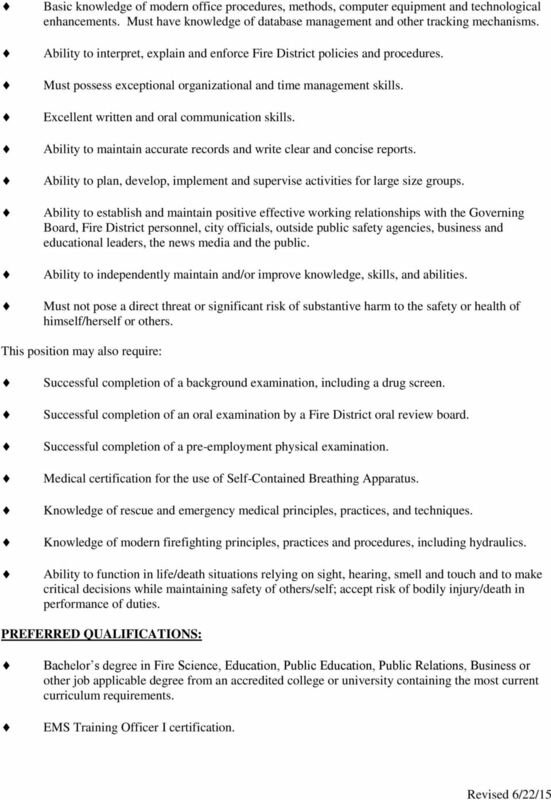 PREFERRED QUALIFICATIONS: Bachelor s degree in Fire Science, Education, Public Education, Public Relations, Business or other job applicable degree from an accredited college or university containing the most current curriculum requirements. EMS Training Officer I certification. 5 Completion of the National Fire Academy s Course Design and Training Program Manager courses. Experience in classroom instruction and curriculum development. Ten years of fire service experience. PHYSICAL REQUIREMENTS In order to perform the essential functions of this position, the employee must be able to do the following with or without accommodation: crawl, run, climb, crouch, bend, stoop, twist, reach, contort, and lift up to 175 lbs. while wearing heavy protective gear weighing about 50 lbs. in all kinds of environments, as described below; face exposure and take precautions against carcinogenic dusts, toxic substances, infectious agents, and the visual/emotional shock of burn/trauma victims. ENVIRONMENTAL CONDITIONS Emergency firefighting environment; work in intense life-threatening conditions; exposure to fire, smoke, bodily fluids, noise, potentially hazardous materials, dangerous animals; hazards of emergency driving; hazards associated with traffic control and working in and near traffic, natural and man-made disasters and hazardous materials incidents. DISCLAIMER Nothing in this job description is a guarantee, promise, or contract for consideration for promotion, for employment, or for any terms and conditions of employment. Employment is at all times "at will." Either the District or the employee may end the employment relationship at any time for any reason. The Governing Board and Fire Chief have complete discretion for all policies, procedures, and decisions. No one has the authority to make any oral or written promises that will be binding on the District with regard to employment, unless the promise is explicitly set forth in writing in a document entitled "Employment Agreement. 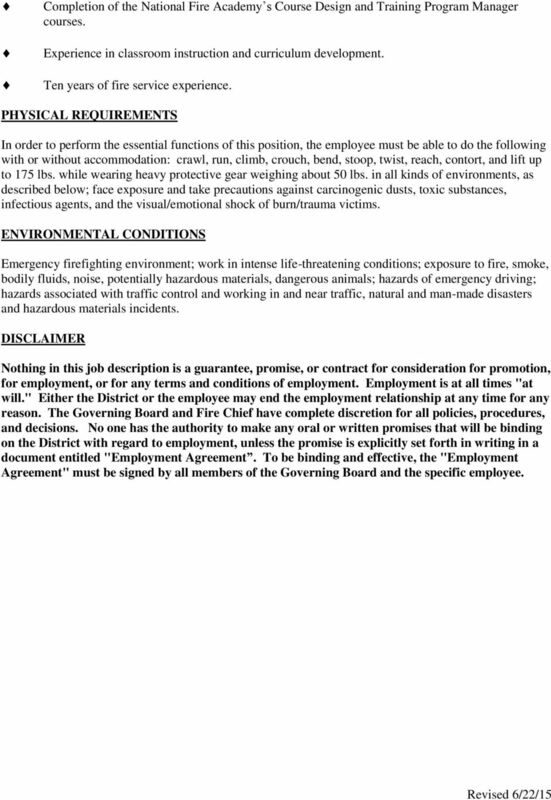 To be binding and effective, the "Employment Agreement" must be signed by all members of the Governing Board and the specific employee. Position will transition to state certified police officer status by August 2015.